Want to know something that drives me crazy? Normally I’m a pretty relaxed person. But. When chefs / recipes writers give insanely conservative estimates of how long food will last. It really makes me mad. I understand that no one wants to get sued from making someone sick. But what about all the food that gets wasted? Seriously, my home made mayo is only going to last in the fridge for 3 days? Then how come I’m still alive and have been eating 2 week old mayo on a regular basis for years? So when I got the following comment from one of my cooking school students, I thought it was a perfect excuse for a rant, which fortunately we’ve already got out of the way. It’s also a great reason to help you make educated decisions for yourself. Oh and save lots of harmless deliciousness from meeting an untimely end! “I am amazed how well fresh fruit and veg last when stored correctly. I often threw out food after 2-3 days before as I didn’t know how long it could last in the fridge so thank you so much for sharing that information. How do you know when food is still safe to eat? With fresh produce you can tell by looking.. Wilted / browned / sad looking / slimy are all signs your fresh produce is ‘past it’. Eating this produce won’t make you sick, especially if you cook it but it’s not necessarily tasty. Use your judgement on what can be ‘rescued’ and what needs to go to the chooks / compost. First, have a good look. If you see mould or yeast spots (little shiny spots) growing then throw it out. These are generally the first to grow long before any bacteria that will make you sick. Occasionally I’ll scrape off the mouldy bits and eat the rest (after a thorough reheating). But if serving to others, especially my children, I don’t risk it. But if there’s no visible signs of spoilage and I’m still a bit concerned, I use the ‘smell test’. If it smells funny or just ‘not right’ then again turf it. And if it’s passed both tests above but I’m still a little concerned, I make sure I heat it until it’s super hot before serving. One of my jobs when I was working in the food industry was to determine how long to allow as the shelf life on breakfast cereals, snacks and biscuits (cookies). We were always really conservative because we wanted to make sure the consumer had a great experience. It wasn’t like one day the food tasted amazing and the next day it didn’t taste good any more. The changes in an unopened packet would gradually happen over months. The first sign would usually be a dulling of flavour or change in texture. These products would still be edible years after the best before date expired. By their nature (very low moisture) there wasn’t any risk of food poisoning. They just wouldn’t taste very good. But what if I’m still worried? Please, please trust your own judgement. If it’s going to stress you out to eat something you’re better off to throw it out and waste a little food. There aren’t any prizes for bravery in the face of questionable food stuffs, at least none that I know of. Beef cheeks are one of my favourite cuts of meat. If you’re wondering they’re actually the cheeks of the cow from the face… Not the behind! I love them because they’re full of gelatinous goodness and cook down to be super moist and flavoursome. You might need to them from your butcher but they’re seriously worth the effort. 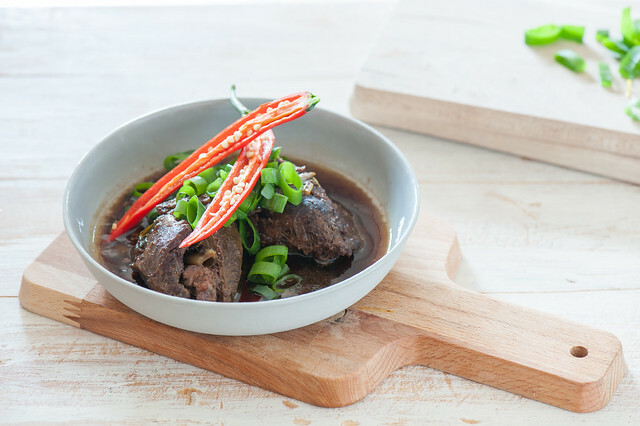 This recipe is my simplified version of Sarah Wilson’s beef cheeks in her fab book Simpilicious. It’s one of the few things I make in my slow cooker without browning the meat either before or after slow cooking. The soy sauce is the secret ingredient here which adds all the lovely complex ‘brown’ flavours… A little slow cooker magic! 1. Chop beef cheeks into 2-3 large chunks each. Place in your slow cooker (oven instructions below) with the soy sauce, 5-spice, most of the green onions, chillies and 1/2 cup water. 2. Cover and cook on low for 10-12 hours or high for 5-6 hours. They’re done when the beef is super tender. 3. Taste and season with extra soy, if needed (it usually doesn’t). Serve on a bed of rice / cauli rice with with extra green onion on top. additional flavours – a few cloves or garlic and some finely chopped ginger are lovely additions but not essential! no slow cooker – just pop everything in a large casserole dish with an extra 1/4 cup water (so 1/2 cup in total). Cover with baking paper as above and seal the top with two layers of foil. Bake for 4-5 hours at 120C (250F) or until beef cheeks are super tender. 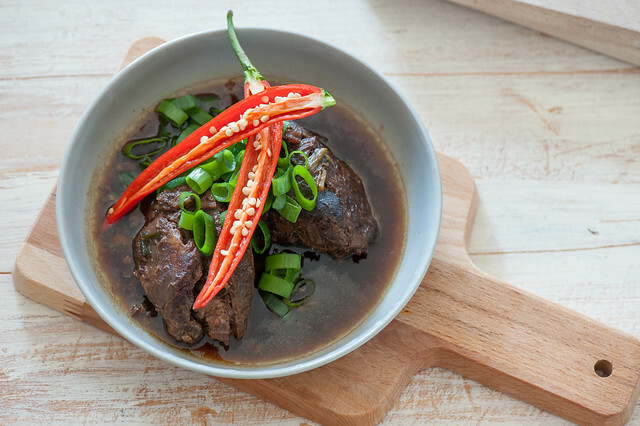 soy-free – use coconut aminos instead or 1/4 cup fish sauce and 1/4 cup beef stock. no beef cheeks – use your favourite slow cooking cut of meat such as osso buco, beef short ribs, chuck steak, brisket, chicken drumsticks, pork ribs, pork shoulder, pork neck, lamb shanks. But beef cheeks really are worth tracking down! vegetarian – replace beef cheeks with large flat mushrooms or sliced eggplant and use a good veg stock instead of the water – just roast in the oven covered (180C / 350F) for about an hour – you don’t get the benefits of slow cooking veggies that you see with meat. Serve with a generous handful of roasted cashews for extra protein and fat. ps. How do you feel about this? Agreed, especially about the mayo. I make my own and it’s fine for weeks in the fridge. Beef cheeks are delicious but hard to find in my ‘hood. Nice one Stuart… But what about the ones that pass straight through? I’ve been following the advice you posted for quite some time now. If I have any question I’ll throw out the food, because I don’t like eating anything that tastes even a little bit off. I agree that most things last a lot longer than the expiration date. This question reminds me of the large can of apricots that my mother had in her pantry for 20 years (not an exaggeration). One day she decided to open it and she and my sisters ate it without any harm. She did make sure the lid was not bulging before opening it. I’m not sure what the flavor was like; the apricots were sort of brownish-colored, and I chose not to eat them because I didn’t like how they looked. But they were still edible. I think the guidelines you posted are just plain common sense. My question pertains to meat. My son will buy a small package of boneless chicken breasts and throw it in the fridge. Is the meat still good after 2-3 days? I rarely do this, so I don’t have a good answer for him. Any guidelines? With chicken Debra I always follow the best before day (well maybe I’d go one day over) but raw chicken is the one thing I don’t mess with. The shelf life depends on how it was packed so hard to say how long it will last. I rant about this all the time because some members of my family “believe” the “best before” date is edict from God. I’ve always trusted my nose and eyes when it comes to food and I’ve rarely been wrong – in fact I can’t remember when I got sick from eating something in my fridge or pantry. Some people say that you should pay attention to dairy best befores but I still use my eyes and nose – if the yogurt smells good and looks fine what can be wrong with it? In our part of the world there are very few butchers still available and even those mostly buy their meat already prepared for sale but I’m going to see if there’s any way I can get beef cheeks; it sounds terrific. Hi there!! Don’t forget you can turn that “waste” into beautiful compost!!! Also we have a flock of chickens and a couple of potbelly pigs to clean up leftovers gone over their time. Great post! Could you help us understand some of the safe temperatures we should consider as well in order to preserve our foods, or to reheat those leftovers to? Is there a temperature range that kills most/all harmful bacteria, or prevents it from growing? One other test is what I call the fizz test. Sometimes the look and smell are not enough. Certain leftovers, when tasted, seem sort of carbonated or vinegar-like from the decay thing going on. // Several other notes. Anyone with stomach or intestinal problems should seriously avoid food that’s starting to go bad. We are talking about decay and rotting here, not age spots or greying hair. // Not everyone can tolerate every food that’s going bad. Process lunch meat is a huge No for me because visits to the toilet increase. // Proper refrigerator temperature is key. When in doubt freeze. My sister thought a bit in the microwave was reheating — it needs to be seriously steaming (even bubbling hot). // Parannoia is Not necessary. But good food hygene does require some attention. We bought freezer safe tape and a Sharpie pen. Everything gets a name and date, even stuff in the refrigerator. Now there’s far less guessing or worry. // I appreciate the rant. We just need to call a spade a spade. Old food is decaying, fermenting, and becoming non-food. That mold and fuzz are a signal. If you have a cast iron gut then it matters less. My Mom just to scrape the fuzz off and eat it up with no problems. Sorry, doesn’t work for me and my health issues. I think a big problem is that many people have a very large fridge that is full of stuff and then often don’t know what’s sitting in the back – it gets forgotten – and before you know it, it gets tossed! Shame, really. If leftovers are not being consumed the next day, why not just freeze them? Terrific article! I often wondered about the “expiration” dates. Your logic makes much sense. Appreciate the helpful guidance. I love leftovers too Wendy! A few years ago I had 6 months living on dumpster food. It was winter, I wouldn’t have been so confident about it in summer. I had no health problems, but I was also careful, processing or packaging everything that needed it as soon as I got home – sometimes took a couple of hours! But now I spend a lot of time in Indonesia, and cooked food is often left out of refrigeration and still fine the next day. But then, I don’t seem to get tummy bugs – others do, for no apparent reason. We are not a “one size fits all”. I’m with you on this one Jules. I’m convinced manufacturers are only covering their backsides when they put very conservative use by dates on their products. I don’t know if it’s my imagination but it seems to me packaged goods nowadays have much shorter use by dates than they used to. Only yesterday I found some sour cream that was six days past its expiry date; I also had a new tub. I smelt and tasted both and found no difference, so I used up the old tub with no ill effects today. If I have any concerns, I will look, smell, and maybe taste a tiny amount. I’ve noticed things like ham or bacon develop a “yeasty” fragrance, if they are turning bad. I can’t tolerate these items, but the rest of my family can. When I took a food safety course, we were given some suggestions regarding mould. e.g. If it was a hard cheese, it was okay to cut away, as long as you cut at least an inch further than the visible mould. Apparently there are reactions occurring in the surrounding area? I have also begun to try to label all the leftovers that go into the fridge with a date, as I hate waste. Great to read this post – I can’t stand the unnecessary waste of perfectly good food either and have been using the sniff test etc for years. I am ruthless about it and have eaten lots of delicious, if a bit old, food as a consequence, to no ill-effects. I grow my own garlic and preserve the roasted cloves in jars of olive oil in the fridge. It takes some time to do them all. I harvest in December and I’m not sure how long they would last if I left them longer but they are always used up by February. One day I saw a “recipe” on someone else’s blog for exactly the same thing, only this woman said you could only keep the garlic for a week in the fridge that way. For me there wouldn’t be any point in doing it at all if it only lasted a week- so I wrote to her to ask about the discrepancy. She answered that she had been doing it for years and years and it only lasted a week. Interesting, but I’ll stick to what I know…. I was visiting a cousin some years ago while she was preparing for a party. She saw that 3 unopened quarts of milk in her refrigerator were 1 day passed their use by day and promptly opened each one and dumped them down the sink. I couldn’t stop her. I taste test milk and only dump it when it tastes sour. I also remember that there are recipes that call for sour milk. I have yogurt that is months past its use by date and only taste a little sharper. In my 50+ years of yogurt eating, I’ve only once opened a jar that had mold on top and that one got dumped. There are use by dates on medications as well. The US Army commissioned a study on how long medications are good beyond their use by dates. They found it depends on storage conditions. Medications could be effective years beyond the use by date if stored correctly. That would save them a lot of money with all the medications they kept on hand. I am not suggesting that anyone should keep medications for years beyond their use by date as I doubt that people have correct storage conditions around their houses. I often eat commercial unrefrigerated mayo in a squeeze bottle with no ill effects. I did this traveling on a sailboat in the tropics. It’s safe if you don’t contaminate the mayo. If you open a jar and stick a dirty spoon in, this won’t work. Not sure if you could keep home made mayo clean enough. Apart from avoiding the waste of precious life (animal or plant), consistently buying food, and meat in particular, close to the “best before” date also saves me lots of money in the long run. Great article, and beef cheeks are wonderful! Can you do this with a frozen cut and if so, how long cook time? My husband and I found it necessary to buy the “reduced” produce from our local grocery store when he was out of work for a year after he was discharged from the service. I pared away the soft spots and we cooked and ate the rest. We became so used to doing this that we have continued to shop and eat this way for over 40 years. We have never had food poisoning as far as I know. I think food is usable for much longer than most people think. I have found that prolonged heat will cause many dry products to go rancid though. Thanks for this Jules, I keep food longer than recommended for the most part and do the nose, colour and sometimes even a taste test as I hate to waste good food. If in doubt though, I will throw out as I don’t want to to make us ill. But recently I have been reading that every day our fresh produce looses a large amount of its nutritional value. Do you have a comments t on that? Sue, my understanding is that veg continues to respirate/breathe after bring picked. That process breaks down the stored organic materials in the produce, so over time, there is some nutrient loss. I’d think, though, that as long as there’s enough colour and freshness to eat it, there’s still enough nutrients to make it worth the while :). Great & timely rant, Jules! Have you seen High Fearnley-Whittingstall’s mini-documentary on food waste in the UK? I’m in the States, but I’m sure our figures are just as shocking, if not worse! My fav strategies in my own life include: a veggie scrap bag in my freezer that gets turned into stock with some bones once it’s filled, cooking produce that’s no longer appealing fresh (soups + stews for veg and chutneys + jams for fruit), and, of course, feeding everything else to the chooks! Backyard chickens alleviate so much food waste guilt for me, especially with 2 fussy toddlers. One surprising thing I learned recently is that you’re expected to throw away children’s car seats after 6 yrs, rather than reuse for younger family members. I can’t imagine this is good for the environment, as they’re mostly plastic! Amazing to me, this disposable culture we live in, where absolutely nothing is made to last :(. Food waste is just one part of a huge problem! By the by, old clothing can also be composted once it’s truly unbearable! As long as it’s a natural fiber, that is. Every little bit helps, I guess :). That bit about clothing should read “unwearable” instead of unbearable :). The well-meaning follies of auto-correct! fine up to a few months later.